John Grey's quality range at popular prices. Here, in the Broadway range, are drums in the John Grey high tradition of quality and fine finish, produced specially for the drummer who seeks high grade equipment, moderately priced. 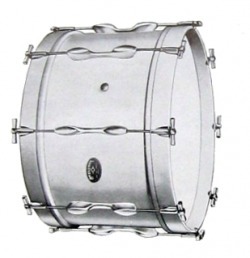 A popular new Snare Drum, with die-moulded hoops and John Grey self-aligning fittings. Metal parts chromium plated and highly polished; laminated wood shell finished first quality glossy cellulose enamel, white or black to choice. Instant snare throw-off, with fine adjustment: coiled wire 'Hot-Snap' snares. 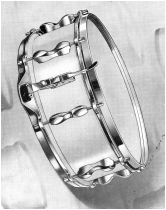 Here is a popular newly-styled Snare Drum with die-moulded hoops and the well-known John Grey self-aligning fittings. metal parts are chromium plated and brilliantly polished. Entirely new snare fitting giving positive action and maximum adjustment. Twenty strand coiled wire 'Hot-Snap' snares. White batter head and Slunk Snare head. Internal tone control. In white or black enamel, white, black or blue pearl, silver, gold or red glitter. 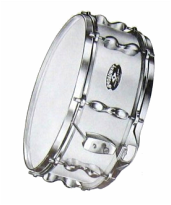 A newly designed snare drum with rolled steel hoops of exceptional strength, six self-aligning fittings, new snare fitting giving positive action and maximum adjustment. All metal parts chrome plated. 'Hot Snap' snares and matched vellums. In white or black enamel, white, black or blue pearl, silver, gold or red glitter. 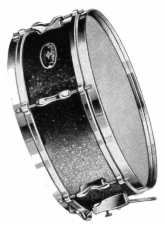 The most outstanding Snare Drum in its class. Soundly constructed, exceptional response and striking appearance. Laminated wood shell. Six self-aligning tension fittings. positive action snare mechanism with coiled wire snares. All metal parts chromium plated and polished. Available in black or white mirror plastic, marine, grey or midnight blue pearl, red or turquoise glitter. 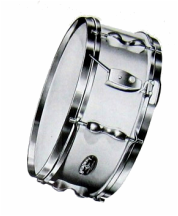 An inexpensive Snare Drum, soundly constructed and of excellent tone. Flanged metal counter hoops, with six separate tension fittings - all metal parts heavily nickel plated. Laminated wood shell, enameled white or black to choice. Simple, reliable snare throw-off, adjustable for tension, with coiled wire 'Hot Snap' snares. Selected white batter and snare heads. 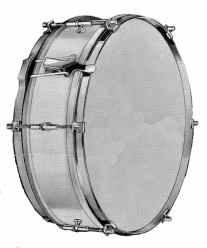 An inexpensive snare drum. Soundly constructed and of good tone. Six self-aligning fittings, reliable snare throw-off. Metal parts chromium plated. In white or black enamel, silver, gold or red glitter. Model 500 14" x 3"
A single tension model of good tone. Strip steel hoops and six tension screws, adjustable snare. Good vellum heads. Finished in white enamel or assorted plastic coverings. Constructed to the characteristic high standards of all John Grey products, Broadway Bass Drums represent outstanding value in their class. The separate-tension models are outstanding examples of good value, and incorporate streamlined die-moulded fittings of the latest pattern. The single-tension models are inexpensive instruments, strongly constructed, of dependable quality. John Grey Broadway Tom-Toms are recommended where consideration of price makes inexpensive instruments desirable without the sacrifice of quality and tone. These Broadway Bass Drums have their laminated shells internally reinforced. All models incorporate the latest streamlined tension fittings; metal parts are chromium plated and highly polished. One internal tone control is fitted; the fine quality white vellums are carefully matched. Well constructed drums with reinforced laminated shells. Six single-tension fittings, nickel plated, with tympani handles and centre supporting pedestals. Good quality vellums. 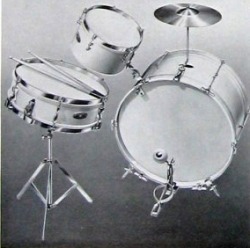 An inexpensive and reliable range of drums. Laminated wood shells with die-moulded counter hoops and self-aligning tension fittings, heavily chromium-plated and polished. Good quality matched white heads on moulded flesh hoops. Two internal tone controls, die-moulded hoops. Strongly built laminated wood shells, and self-aligning tension fittings. Metal parts are chromium plated and polished. Quality white heads on wood flesh hoops. One tone control, die-moulded hoop. Comprising instruments from the John Grey BROADWAY range with all the necessary accessories. An up-to-date outfit at a modest cost. 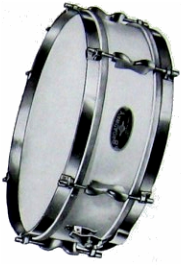 Broadway Drum outfits, while inexpensive, are made to the high standard of quality associated with the name John Grey, and are offered with every confidence. An inexpensive yet complete modern style outfit. Available in a choice of attractive finishes. Black or white enamel, midnight blue, grey or marine pearl, turquoise or red glitter.